Understanding the ingredients in paint is the first step to making a quality paint selection. Facility managers have a seemingly unlimited number of options when it comes to selecting paint for a particular application. This is good news because it allows facility managers to select a paint most suitable for the application. But it is also bad news: Given so many options, how does a facility manager decide which is the most suitable paint for the project? It gets even more challenging. Paint that is supposedly suitable for a particular type of application comes in a wide range of prices, some costing two to three times as much per gallon as others. A widely accepted rule of thumb states that as the quality of the paint increases, so does its price, but how can a facility manager be sure? It could be that the higher quality paint really does cost more, but it could also be that a particular manufacturer simply inflated the cost of the paint to make people think it is a higher quality paint when it really isn’t. And is all that high quality really necessary for all applications? Why not just pick a less expensive paint and save money? Looking only at the material costs of a painting project ignores the total cost of that project. 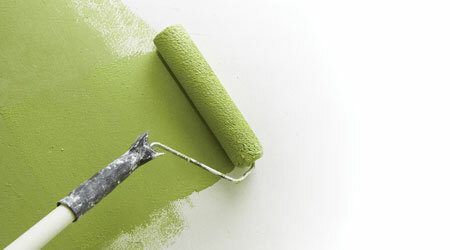 Less expensive paints may be more difficult to apply, require more coats to cover, or provide a shorter service life. Paint is an investment. Instead of looking only at the cost of the paint in the can, facility managers should consider the cost per year of service that it provides, a form of life cycle costing. Understanding what components go into a paint, how they affect quality, and what that means will go a long way to helping facility managers make the best decisions. A typical can of paint can include as many as 15 or 20 ingredients. Most of these can be lumped into four general categories: pigments, resins, solvents, and additives. The types and concentrations of ingredients used in the production of paint vary by manufacturer. Varying the materials and their quantities has definite benefits and limitations, particularly when it comes to the overall quality of the paint, but it is important to remember that there is no such thing as the perfect paint. Understanding how the ingredients affect quality and cost will help facility managers select the one best for their particular application. Pigments are the finely ground particles that give paint its ability to hide the surface. The most widely used pigment in high quality paint is titanium dioxide. It is more expensive that other pigment, such as clay or silica, but it hides better. Lower quality paints have lower percentages of titanium dioxide and will need more or thicker coats to provide the same coverage, increasing labor costs. Resins are the binders that hold the pigments to the surface after the paint dries. They create the paint’s film. The quality of the binder affects a range of paint performance characteristics, including adhesion, crack and peeling resistance, and stain resistance. The higher quality the resin, the better its binding abilities. For latex paint, the best resins are acrylic. Acrylic resins contain smaller particles that allow the paint to better penetrate and bind to the surface. This better binding is what gives acrylic resins their resistance to blistering and peeling. Different acrylic binders may be used to give the paint different properties, such as resistance to ultraviolet light, abrasion, or moisture. Since acrylic resins are more expensive, they tend to be found in the higher quality paint. For oil-based paints, the most common resins are linseed oil, soya oil, or alkyds. They dry to a hard finish with good levels of adhesion and flow. Solvents are the liquids that dissolve the binder and hold it in suspension with the paint’s pigment so that they can be transferred from the brush or roller to the surface. In latex paint, the solvent is water. In oil-based paints, the solvent is paint thinner. In most paints, the pigment and binder components account for 25 percent to 50 percent of the total volume of the paint. The majority of the rest of the volume is the solvent. Higher quality paints will have a higher ratio of solids to liquids. The fourth category of ingredients includes all of the additives that manufacturers mix into the paint to enhance some of the paint’s properties. Thickeners and modifiers are used to help make the paint easier to apply. Defoamers help to prevent the formation of bubbles in the paint during the manufacturing and stirring processes. Co-solvents increase the hardness of the film formed by the binder. Biocides resist the growth of mildew on the paint’s surface in exterior and high moisture interior applications.